Rocweb is the replacement for all mobile clients. Starting with release 559 the ESU Mobile Control 2 is no longer supported. This is an exclusive goodie for supporters of the project, who have a valid Support Key installed. andRoc will run 5 minutes after connecting to a Rocrail server without a support key. After those 5 minutes andRoc will shutdown without warning. Loco image cache to reduce startup. SpDrS60 symbols only → See External Symbols for alternatives. User interface is localized; Depending of the language selected for the device. An up to date Rocrail installation. Preferred are small loco images; normal sized will be down scaled to 50 pixels high. Connects to the client port of the Rocrail server. Android derivates, like CyanogenMod, are NOT supported. This method is preferred; You will be notified about updates, and crash reporting is supported. Search for andRoc or Rocrail in Google Play. 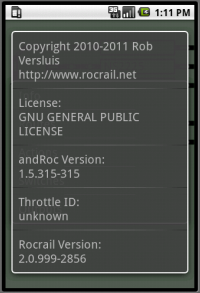 android.permission.INTERNET To enable a network connection with the Rocrail server. android.permission.READ_PHONE_STATE For using the cell phone number or device ID as throttle ID. android.permission.CHANGE_WIFI_MULTICAST_STATE Multi cast for R2RNet announcements. andRoc will use the selected device language if available. It defaults to English. Navigation between the activities is done by the Menu. 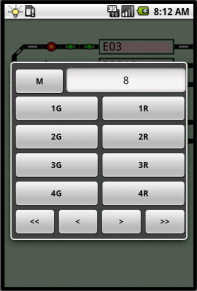 Starting with revision 512 the options menu can also be opened by clicking on the tripple dot in the right upper edge of the display. Touching the Loco image will cycle through the Throttle, Loco and Loco Setup activity. 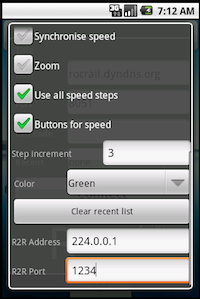 After connecting the Rocrail server a dialog shows the progress of loading the plan. The last host:port combination is saved for the next session. The plan title of the Rocrail server which did announce itself over R2RNet. The IP address or computer name of the target Rocrail server. The "Help/Info" dialogue of Rocview will show you the IP adress. The client port of the Rocrail server. Default 8051. The Control and Slave code. 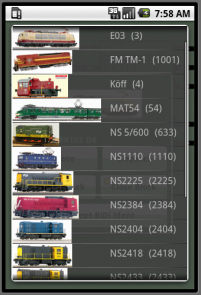 Select one of the previous connected Rocrail server from the list. This option needs a restart of andRoc to get active. Use this option with care because this requires a lot of processing power on small devices and can block the user interface of andRoc. Leave it off for normal use. Prevent the device of going into sleep mode. Switch directly to module view in case the loaded plan is modular. 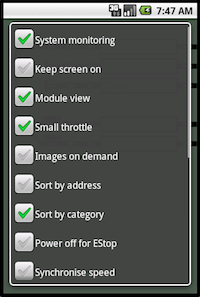 Option for large displays to keep the throttle dialog small. Default is 300 x 380 device units. It can be changed by setting the Throttle width/height. Do not use this option on small devices. Load only loco images as needed to decrease communication at startup. Sort loco list by address instead of ID. The blue arrow represents the Loco placing. Trainset: Independent from engine type if commuter flag is set. Special: Cleaning or Post type. All Road names found in loco definitions are listed as category. If a loco or car has no Road name set it will be added in the "None" list. Use power off instead of emergency break. Enable throttle speed update. Disable in case of a slow network to avoid slider jumping. Enable the zoom tool in the layout activity. Option for decoders with 127/128 speed steps to set the slider resolution 1:1. Use buttons instead of speed slider. Auto repeat after 1 second. If not using all speed steps this number is used for in- and decreasing the speed. Clear the list of recently connected Rocrail servers. 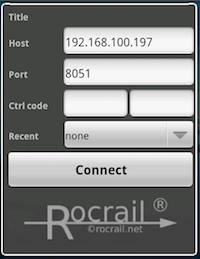 If a Rocrail server has R2RNet activated it will provide its client connection information by multi casting to the andRoc clients. If Ping is activated andRoc will send every 2.5 seconds a ping to the loco controlled in the throttle. If the ping will not come within 5 seconds the Rocrail server regarded the andRoc connection as broken and will stop the loco immediately to prevent accidents. Add a → Guest Loco by address. The new guest loco will appear in the loco category "Special". The default is DCC and 128 speed steps if only the address is set. In this case the loco ID will be the same as the address. Note: For all attributes, except Address, is a Rocrail server needed with revision 4559+. A short touch on the loco image will open the Loco list for selecting. A long touch on the loco image will open the Loco activity. The first line under the Loco image shows the ID and between brackets the automatic mode. 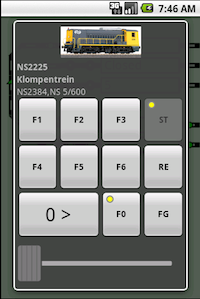 If the selected loco is in a block, or moving from one to another, this will also be shown on this line. If the automatic mode is idle or wait the background of this line will turn to red. Otherwise it will be green. 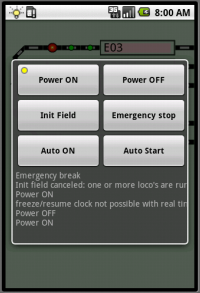 Start/Stop automatically running the selected loco if the auto mode is activated. This button is disabled if the auto mode is not activated. Release a loco from this throttle. Without releasing a loco from a throttle it is not possible to control it by another throttle/client. This behavior can be manipulated by disable steal loco control. A long click will send a power off command. Function group selection button. There are four groups of 6 function buttons available. A long click will send an emergency break. A long click will select throttle 1-6. Toggle the locomotive lights on/off. A long click will dispatch the selected locomotive for use with a Fred. 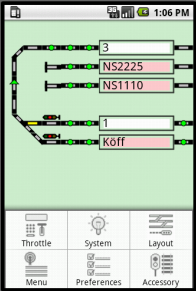 Flips the current driving direction of the loco and shows the current speed. A long click will activate the Consist management. Velocity commands are send if the delta is 5 or at move end. The delta is introduced to reduce the amount of commands triggered by changing the bar position. 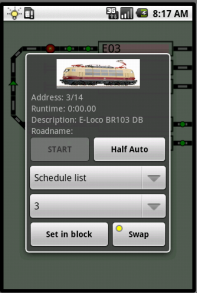 Start automatically running the selected loco if the auto mode is activated. The selected schedule is used as destination if set. Determines if the Start will issue a normal GO or one in half automatic mode. Moves the loco in the selected block. Swap the logical placing of the loco. Activated by a long click on the direction button. 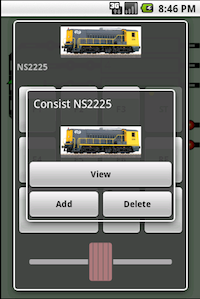 A long click on the direction button will switch to the master of the consist if the selected loco is already a consist member. 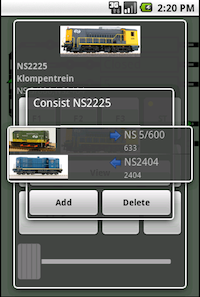 Selecting a loco from the view list will open the loco control which can be used to swap the placing. Car car Only cars with interface address > 0 are listed. Adjust the velocity in all running modes including automatic. Reading CV value from the main needs bidirectional communication. Dispatch the loco for a throttle like the LocoNet Fred(i). This is for testing of accessories. Especially of use at starting up a new layout in Rocrail. Selecting a start address can be done with the numeric touch field or those four buttons on the bottom of this view. On power down a notification is shown. The system activity will get visible if this notification is touched. System events and CS messages are listed up below the buttons of this view. The max. list length is 100, the oldest entry will be removed from the list. 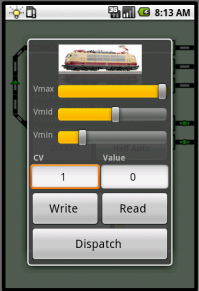 Start all trains in automatic mode. Shutdown the Rocrail Server if its not in console mode and Rocweb is not in slave mode. This action needs a confirmation. Selecting a route will send an activation command to the Rocrail server. This is mainly used for testing. Selecting an action will send an unconditional activation command to the Rocrail server. Information about Copyright, license, Version, Throttle ID and so on are listed up on this view. A list of all available ZLevels. The example shows all module names of a modular layout. This list will not appear when only one ZLevel is defined for the current layout. The first entry in the list is the "modview" visualization if the plan is a modular layout. A single touch on an object will send for most types a Flip command to the Rocrail server. Block, FiddleYard and Turntable objects will send an Open or Close command. A long click and release on an empty spot will activate the zoom tool. A single touch on the block will open a new view for controlling it. Long pressing on an occupied block will open the loco control. Clicking the loco will open the loco list. 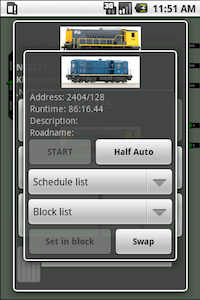 Selecting a loco from the list will set it in this block. 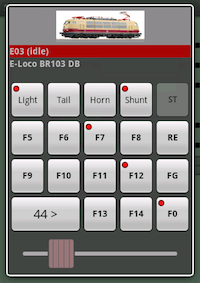 A long click opens the loco control. Touching the loco image will also open the loco activity. Set the block to the Open or Closed state. The LED signals if the block is Open. 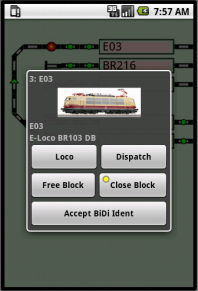 Accept a BiDi Ident from a loco in auto mode. Touching the FY will open a new view for controlling it. Opens or closes this fiddle yard for trains. Move the table to the next/previous track. Move to the selected track. Touching the TT will open a new view for controlling it. Opens or closes this turntable for locomotives. Move the bridge to the next/previous track. They must be deleted manually in case new versions are provided by the Rocrail server. Imagenames are case sensitive under Android. A step by step description on how to reproduce the crash. Attach the plan.xml from the server you connected andRoc with. Try this: Switch To The Stock Android Interface.